The Refold cardboard desk designed by visual communication design graduates Fraser Callaway and Oliver Ward is strong enough to support a person’s weight, versatile in its standing and sitting capabilities as well as its portability. Two visual communication design graduates have modified that revolution in office furniture, the standing desk, so it is portable, affordable and 100 per cent recyclable. 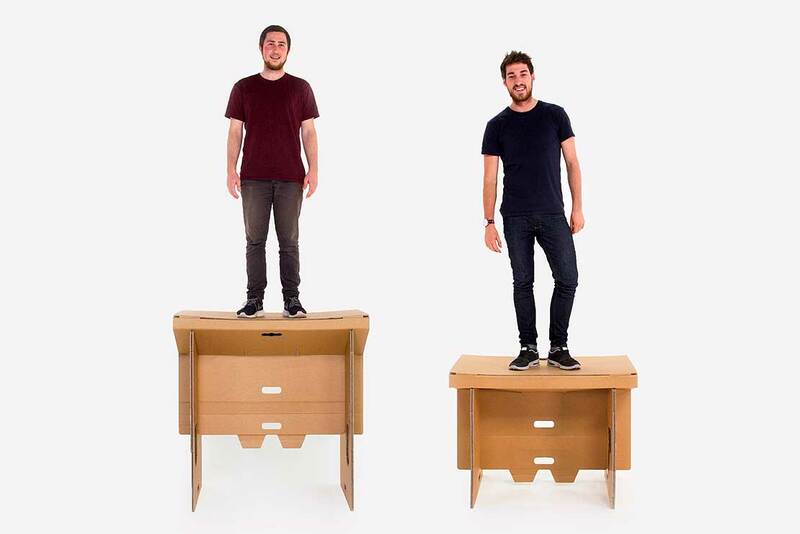 The Refold cardboard desk by Fraser Callaway, 25, and Oliver Ward, 22, is sturdy enough to hold the weight of a person and designed to change the way you work. The desk folds into a lightweight, compact carry case for portability and easy storage. “The desk showcases the perfect combination of innovation and environmental awareness. It’s simple and functional, yet sophisticated and beautiful,” Mr Callaway says. The two men started a company, Refold, based in Wellington, to market the product and this week launch a crowd-funding campaign on Kickstarter where you can back the venture and buy your own desk. The desk can change between sitting and standing height, to ease the transition into a new way of working on your feet. The design folds and slots together in less than two minutes, using four main pieces, with no tape or glue. As it is digitally fabricated, the design is completely customisable and can be adapted to cater to different needs or areas. The desks are 100 per cent New Zealand made and manufactured. “When it’s finished being used, whether it be after a three day event or two years of use as a personal desk, it can simply be put out for recycling alongside all your other household recyclables,” Mr Callaway says. Refold has received interest from UNICEF and is in discussions around trialling them in schools in Samoa and the Solomon Islands. They are also excited about the possibility to “do some good” and use the desks in post-disaster situations. In addition, Massey University has already ordered 50 of the desks for various staff across three campuses. Both Mr Callaway and Mr Ward acknowledged the support of Dr Wilson and College of Creative Arts Associate Pro Vice Chancellor Enterprise, Chris Bennewith, for giving them “the nudge and support we needed” to ensure protection of their product commercially.